Part of the aging process (emotionally) is to try to reverse it, and so I find myself eating healthier. It was a relaxing day and I looked to see what might easily be put together. I made a simple meatloaf of grass fed and finished beef (light on the meat, heavy on the Italian herbs), some chopped red and yellow bell pepper, steel cut oatmeal, fennel seed, a dash of half and half and some tomato sauce. On the side: lots of steamed vegetables. I was listening to a C.D. of La Boheme while putting this eco-healthy meal together and got in the mood for Italian wine. My son called and invited himself for a visit. He loved the meat loaf; said it was light. I loved the wine. 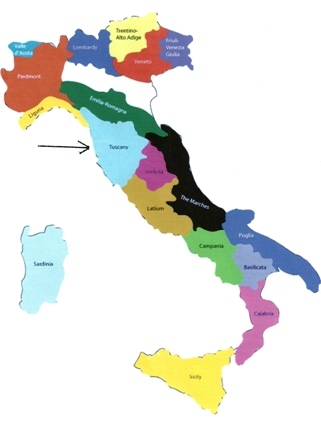 Avignonesi (the producer) is in the Tuscany region (see map) in the sub-region of Montepulciano . But this is not the more regarded Vino Nobile di Montepulciano. Rosso is the commoner to the Nobile’s nobility, and a sensible companion to a plebian meat loaf. And that is its charm. The primary grape is Sangiovese (the grape that made Chianti famous). Grapes are harvested from September to mid-October. After fermentation, the juice is aged for six months (18 months for Vino Nobile by comparison) in large oak casks. It then spends another three months in bottle before being released. That’s it! And it’s delicious. Pouring it high above the glass is fun as you watch the color swirl into the glass. Its color reminds me of a pinot with its light and cherry hues. Similarly, its aroma is of sour red cherry and with a floral scent. The wine is thin and by that I don’t mean weak. The Roso di Montepulciano is elegant in its delicacy, offering balanced cherry spiciness, notes of pencil shaving, and hints of cedar and strawberry with a light minerality and a refreshing finish. The tannins are smooth and the acid bright. This is a red wine that is a joy to drink in warm weather outdoors. There is no need to decant. The wine is enjoyable after opening. It is delicious by itself, but is remarkably food friendly; an everyday drinking wine. I like too that Avignonesi has been working toward making their vineyards organic and biodynamic. In a sense, perhaps I am getting sentimental. In some fashion, this wine reminds me of my childhood: Of the wine made by the Italian neighbors rushing to buy wine grapes as they arrived at the bakery once each year - Each neighbor’s style a little unique, some better but all enjoyable. A wine of pride and happy days that bound not just the tannins to the fruit, but the families to the neighborhood and to each other. Admittedly, Avignonesi’s Roso di Montepulciano is better. But its DOC status (DOGC for Vino Nobile by comparison) reflects its charm and honesty. As I said, this is an everyday drinking wine and very food friendly. And eminently enjoyable. I was fortunate that Avignonesi did not produce a Vino Nobile from the 2009 vintage, so all the best Sangiovese went into their Rosso di Montepulciano. But at average retail prices of $18-$20, and given that Avignonesi is consistent in their product quality, it’s worth tasting what you find. And I liked the meat loaf too. But the wine made it better.